Founded by a team of enthusiasts and professionals specializing in the restaurant industry, this Italian company selects with absolute rigor spices from all over the world and creating curious and original products combining mixtures made by hand without the use of dyes and preservatives. With the products by Il Mercante di Spezie, you can transform your usual dishes in plates from a thousand and one nights. 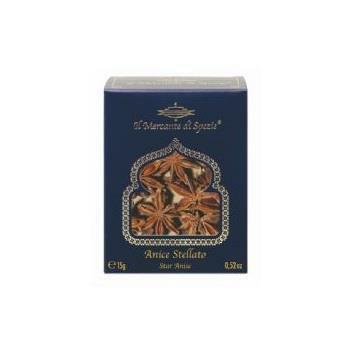 The Star Anise by Il Mercante di Spezie is from southern China. The aroma and flavor are warm and fragrant, with notes of licorice. Whole or ground, it can be used to flavor soups, broths, white meat, especially pork, wild game, fish, shellfish soups, stewed fruit and pastries.